Coming off The Ultimate Trail Magic that you just read about we expected our walk to Waynesboro, Virginia to be filled with thunderstorms every day, trails made from sharpened rocks and a deer every mile to make Hunter run off chasing them. I almost feel like it is bad luck to share this, but our walk from Daleville, VA turned out to be just the opposite and one of our favorite and most memorable sections. 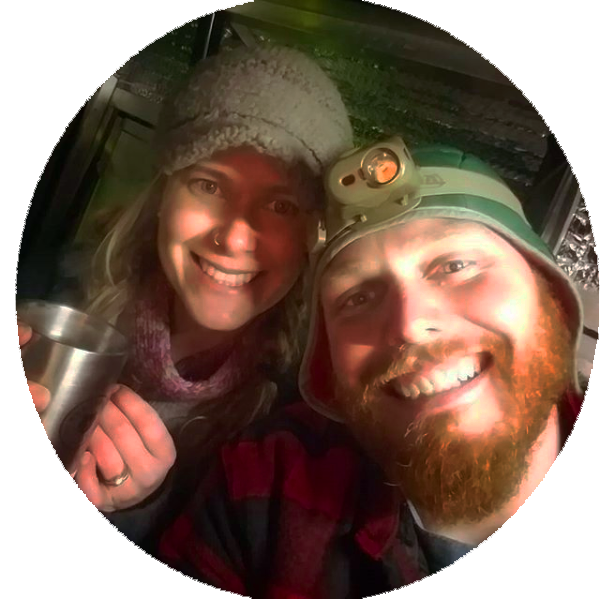 Between more unbelievable trail magic, a visit to a brewery for a friend’s birthday and happy toes from a shoe change, we had a blast walking the second half of our leg to Waynesboro. What a bunch of gypsies! Doing laundry and washing up in the creek! The rising summer temperatures and new shoe break-in-period gave us a convenient excuse to take a chance to stop and smell the roses; especially the ones that grow around swimming holes! We took advantage of the several opportunities to go swimming in this section during the heat of the day and even went as far as changing our hiking schedule to finish a hot sweaty day of walking at a conveniently placed creek or river. This is exactly why people hike the AT, because when else can you quit your job to go walk in the woods all summer and finish a 90 degree day with a dip in the creek and a camp store with homemade milkshakes only 1.3 miles away. We took some reprieve from the heat at higher mountain elevations too, not just at the creeks. 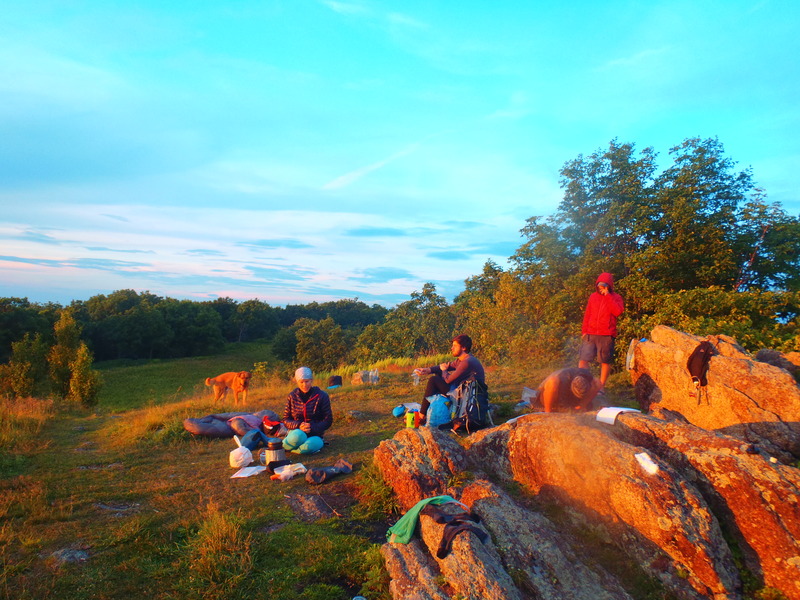 We spent a night at our last 5,000ft peak (until New England) on aptly named Cold Mountain with a pleasantly chilly 55 degree breeze and an hour long sunset we all enjoyed while cooking and eating dinner. Camping on the last bald mountaintop until New Hampshire was a good decision because we were treated to one of the longest lasting sunsets we’ve had since leaving Alaska. Check out this tree growing on top of a rock with no dirt! 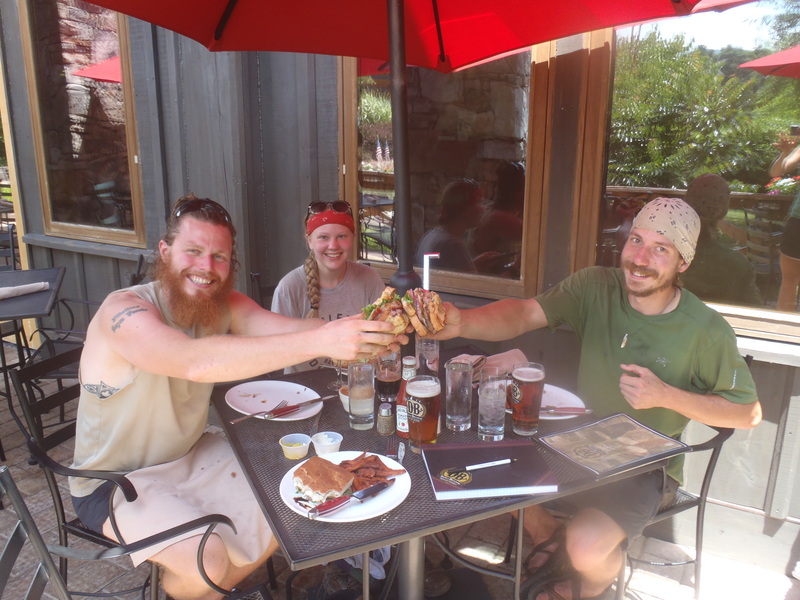 A few days after Cold Mountain our friend “Fern Gully” had a birthday that just so happened to coincide with the day we passed a road intersection only 6 miles from The Devil’s Backbone brewery. Well, we aren’t one to fight destiny so if you walk near a brewery on someone’s birthday you get your thumb out and go down the hill for a few beers! We hit the side of the road and the girls did their best, and despite the non-hiker friendly hitching conditions the six of us were drinking beer in an hour. “Bullfrog”, “Turtle”, “Chubby Bunny”, “Fern Gully” and us, “The Fat Kids” spent the afternoon enjoying some good beers, a birthday shot or two and possibly the best burger I’ve ever had. Being dehydrated and not drinking frequently doesn’t help the alcohol tolerance but hey, at least we were all pretty cheap drunks. Getting back to the trail turned out to be an adventure in itself, packing 6 semi-drunk hikers with all their gear and a very uncomfortable puppy into the back of a 20 year Chevy S10 is a trail memory I won’t soon forget. Looking at my notes I’m starting to realize that people reading this won’t believe that we do any actual work or put in difficult days during our ‘summer vacation’. Only a day or two after the brewery we happened upon some more incredible trail magic. 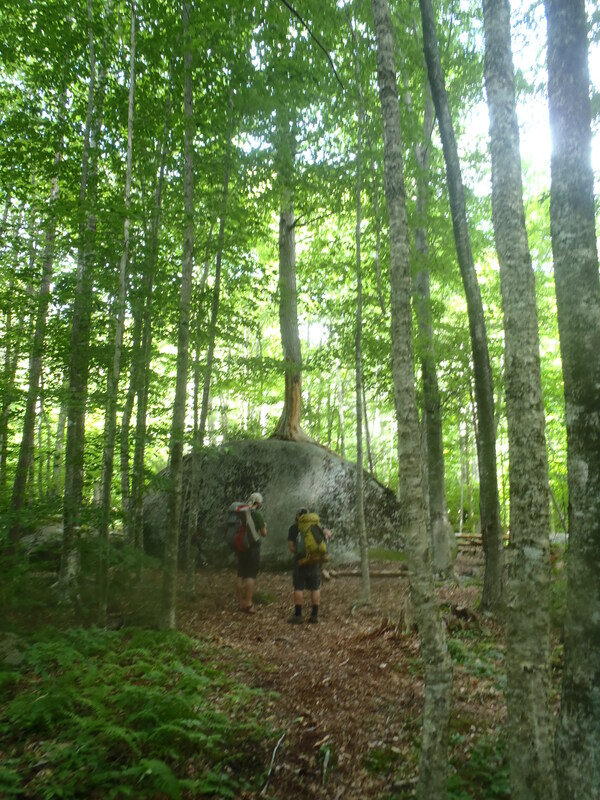 A gentleman of retirement age came walking up to the shelter where “Turtle”, “Fern Gully” and ourselves took a lunch break and asked the group “You guys want some trail magic?”. Uhm… does a bear wear a funny hat? Meet “Trail Angle” John who for two months a year comes out to the trail twice a week. He not only blesses hikers with trail magic by cooking a full pancake, eggs and sausage breakfast at four in the afternoon but does so at a shelter two miles off the trail with food he carries in for hikers. We planned on leaving twenty minutes before he showed up but procrastination paid off and we ended up having one of the coolest trail experiences you could possibly think of. Oh, he brought in a jug of orange juice too. Lindsay and Gully eating some trail-magic watermelon. Hooray! We still walked 20 miles/day with 6 mile long up-hills and temperatures above 90 degrees. We had rocky terrain, giant poisonous snakes and several thunderstorms. 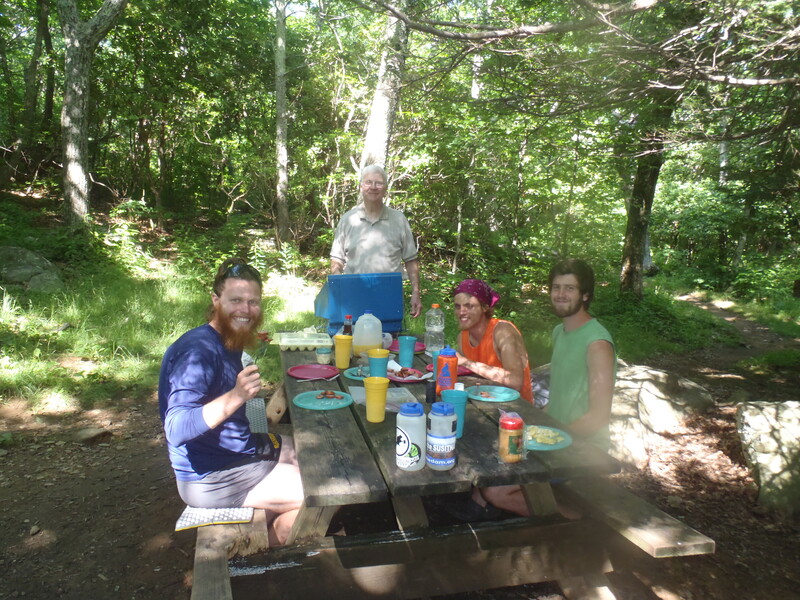 But so does everyone else that hikes the AT each year and if we dwelled on that we would’ve missed these other incredible experiences that happened along the way. For your canadian readers you may want to include kilometers besides its wayyyy more impressive. The last few blogs have been more enjoyable to read and leave you wanting more. What an incredible journey.